Next to having a picnic in the woods, dining at the Si-Pu Nabe restaurant in Shanghai is the best way to enjoy an intimate meal in a nature-inspired background. 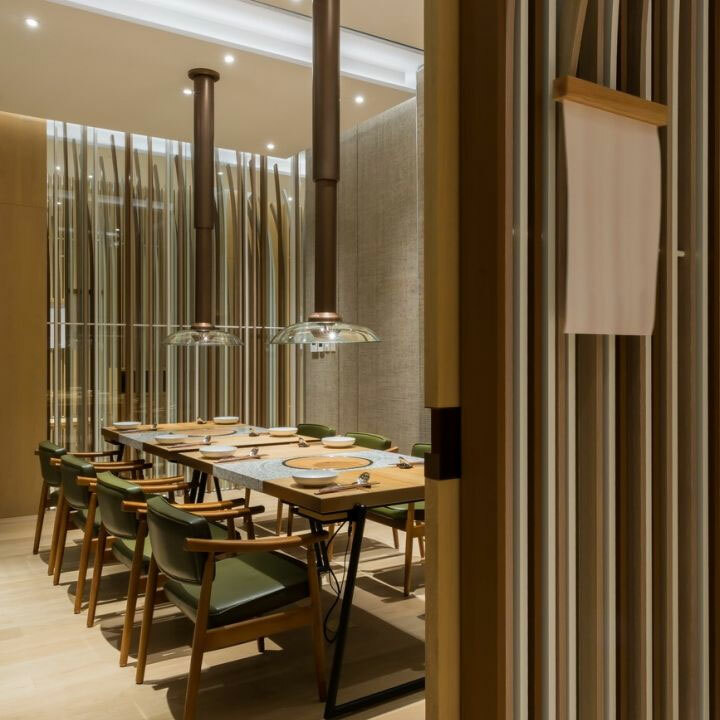 This hotpot restaurant was created by Golucci International Design as a space for small family and friends gatherings, where privacy and a feeling of coziness are the main design goals. Unlike the typical restaurant with its common dining area where an intimate dinner is usually more a wish than a reality, Si-Pu Nabe offers its customers only private rooms, and no central dining area. These come in different sizes, from two-people rooms for romantic dinners to four-people ones designed for small families, and ten-people spaces for get-togethers with friends. 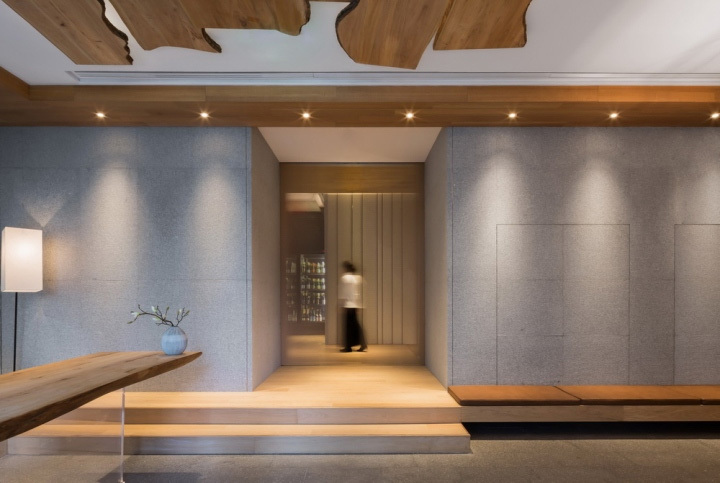 In order to separate these spaces and create an inviting environment, the designers used long and narrow strips of wood curved at the top, evoking the look of the trees. The wood strips draw the eyes upwards, emphasizing the height of the rooms, and lean over the dining spaces, as if caught in a gentle protective gesture. 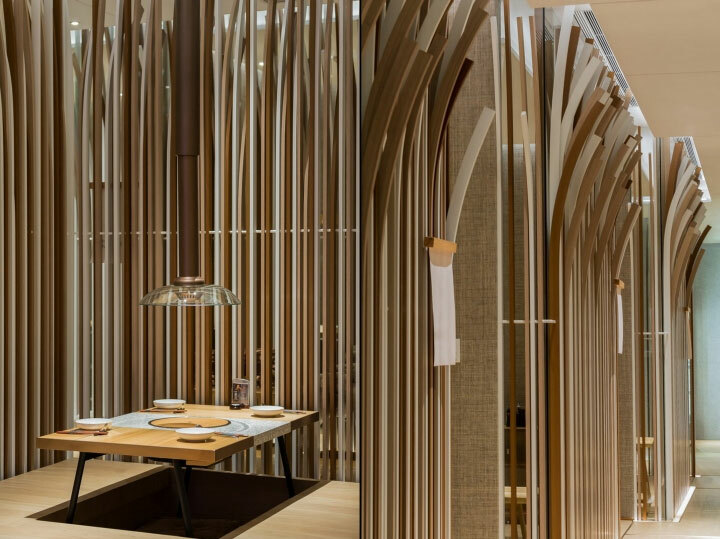 Wood is all-present in the interior of the restaurant, whether in the construction of the tables and low benches, or that of the floor, counters, shelves and cabinet area. 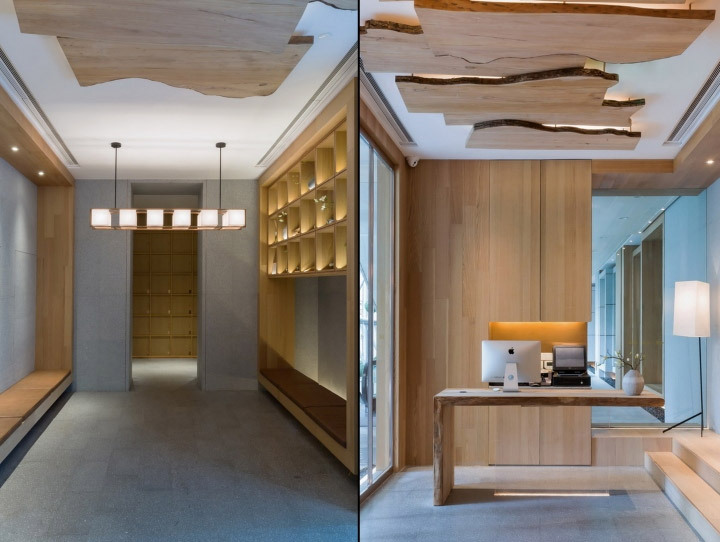 The ceiling wood details at the entrance have irregular edges, announcing the visual theme of the restaurant. This heavy use of wood only accentuates the feeling of coziness and warmth and gives the places a cohesive look. 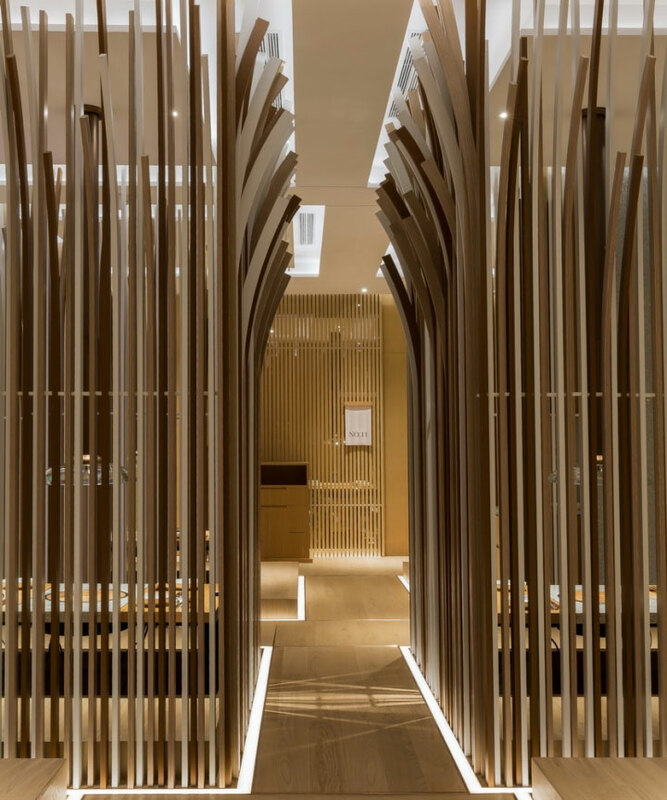 Emphasizing the forest metaphor, strip lights follow the contour of the dining spaces, calling to mind the ethereal look of rising vapors and giving the place a subtle mysterious vibe. The designers strived for and created a simple, perfect flow from the entrance area, with its shoe cabinets, to the dining spaces. Customers use the cabinets to store their shoes before entering the dining area. 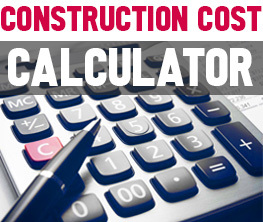 They are provided with disposable slippers, and the floor heating system keeps them warm and comfortable. While the interior design leans towards minimalism, the well-chosen details create an intimate atmosphere, similar to that of a home.